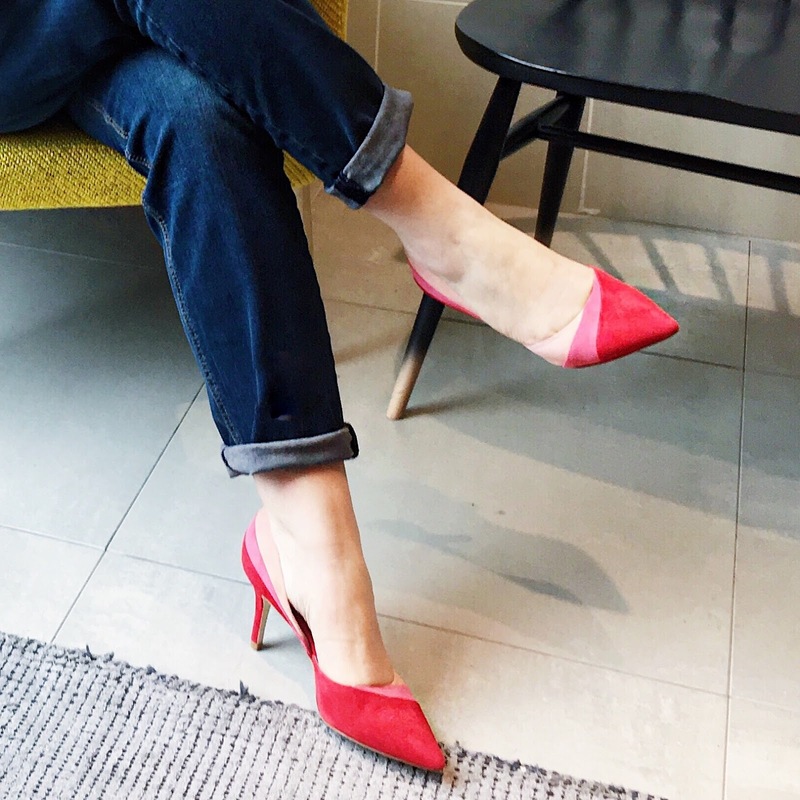 This blogpost is in collaboration with John Lewis & Partners Oxford – They gifted me The Complete Style & Beauty Experience back in January 2019 and I loved it so much I’ve come back to try their PERFECT PAIR OF JEANS which you can book free of charge for up to an hour with a personal in store stylist. Lindsey and I enjoyed another session together exploring jeans. It’s a well know fact that jean shopping is one of the worst shopping experiences a woman can go through. I’m not that keen myself and will leave it to the very last minute or just buy the same old pair and continue to look the same way. Well no more, I say, find the time and get trying on! If you go with the mindset that you are ‘just trying’ then firstly that releases the pressure to find a pair. There are so many different brands, styles, colours and fits it is a real minefield. Aim to get two to three different pairs of jeans into your wardrobe, this will enable you to create different looks and vibes depending on what you are up to! Don’t just buy the same old, same old – it can date your look. Jeans are updated regularly to keep up with modern styling, so make the time and refresh. Exclusive to John Lewis & Partners and hush. These are ideal for straight or athletic body shapes, they are very low waisted and sit low on your hips. As I am an hour glass we’ve had to team this with a loose fit v-neck t-shirt (which by the way I already own, and love it!) and to detract from my wide hips we’ve used a statement necklace to move your eyes up and statement pink shoes to move your eyes down. Because these were not the right shape for me, I didn’t find them comfortable, but it’s good to try first the styles that will not suit you, because then when you get the right style of jean on, I think the appreciation levels of the fit are much higher. Lindsey was really accommodating when I told her I had set my heart on a boyfriend style of jeans, and so to try and combat the issues I have as an hour glass with this style of fit, she suggested that I try AND/OR Boyfriend stye in a dark colour. Darker because this helps to minimise my curvier bum and larger thighs and also this brand has a really good stretch in the denim. The denim in Hush jeans of Look 1 was too tight on my thighs so whilst I could get in them, it was uncomfortable to walk, and that is no good! 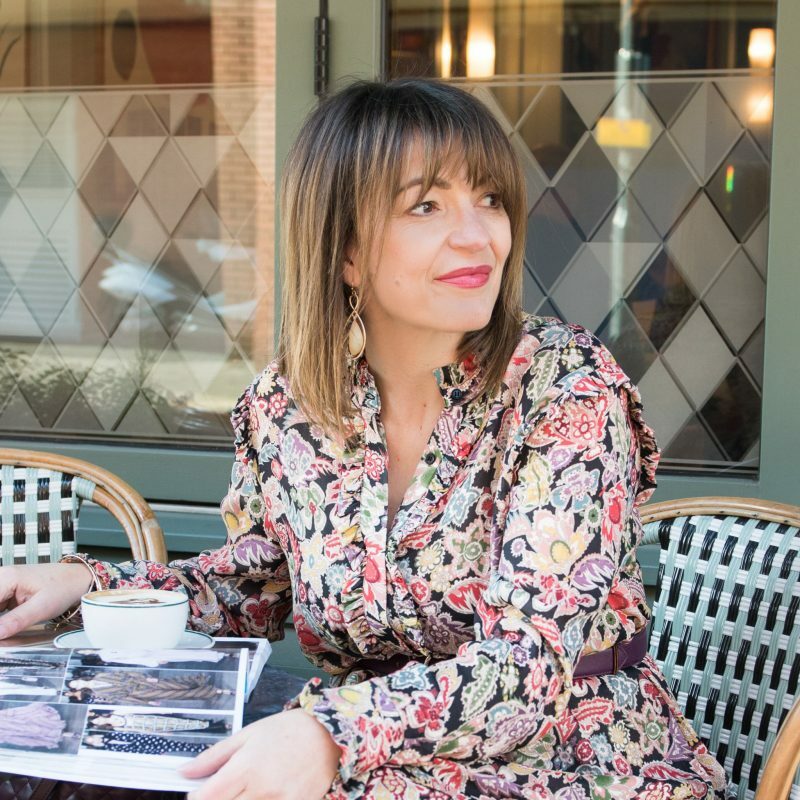 We’ve team it here with a gorgeous floral blouse that elevates these ‘lazier’ style of jean and added a heel to show you can dress it up for a family lunch or a date with the girls. These jeans were super comfy, and whilst they are designed for the Athletic body shape who are slightly curvy, I thought they were a great pair of jeans. You can wear them long or create a shorter length by adding a hem, we did this as we wanted to show a more holiday vibe and the wedges we selected would be perfect for this. The cold shoulder top from AND/OR is new for SS19. We added a slim belt to pull in and create not only a waistline but to show off the detailing at the bottom of the top across the lower part of my waist. I also thought the top was great as you could adjust at the back depending on how high or low you wanted the blouse at the front. To jazz up what could be viewed as quite a dark outfit, we’ve added the orange to give a pop of colour. Now this is the pair of jeans that I never thought I would love, it’s basically the complete opposite to skinnys! I was keen to try jeans that I would not normally wear; as an hour-glass body shape I need jeans to lay flat across my tummy, nip into my small waist but allow for my curvy bum and thighs. I was really chuffed with how good a fit they were on my waist, so much so when I first put them on, I immediate thought they won’t fit because I have to get the smaller waisted part of the jean passed my hips! Not an easy task, but once on, OMG I was in love. The barrel shape leg I felt was far more flattering than the typically wide leg you can get, it just slightly trims which was really flattering. To wear this style of jean, you have to wear a fitted top that tucks in. Here we are showing it without a belt, to prove that you don’t need one, however I personally would to finish off this look. Lindsey teamed the accessories to pick out the little flowers in the blouse just to add colour on a Spring style outfit. Boden describe these shoes as red I found these to be fairly orange so consider them an ‘orangey red’. The Mulberry bag was divine and has been matched with a different strap that has floral design with dots in a midnight blue, it goes perfect with the hibiscus red of the bag. I think this style of jean would be lovely for the office, if you are allowed to wear them, I actually felt very professional as soon as I put them on. I would highly recommend having a look at these, they also come in black, perfect for your daily wardrobe and should you want to elevate your jean style. 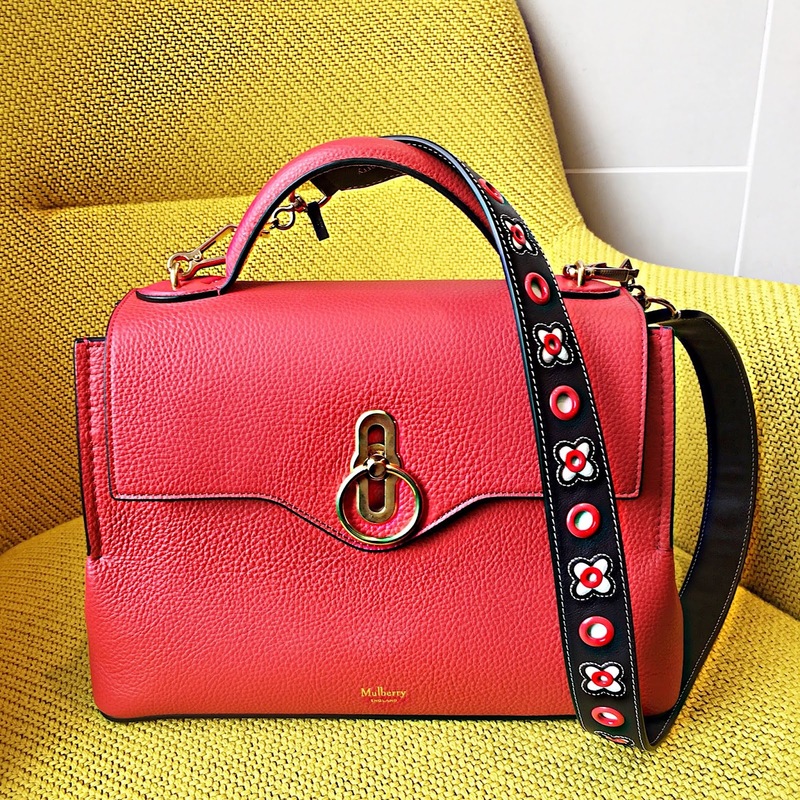 A close up of the Mulberry Small Seaton Classic in hibiscus red teamed with the Mulberry Silky Calf Leather Geo Floral with Dots Shoulder Strap in midnight blue. By far the most flattering, comfiest and Lindsey advises will suit most body shapes and what a fantastic price at £59. Keen to give you a look with a blazer because we all have one in our wardrobe, we added a trendy slogan tee and matched the colour to this gorgeous bag. To not be too matchy-matchy (I’m not keen on everything going together on some outfits) – we added some animal print just to elevate this classic style into SS19. I think you could pretty much wear this look anywhere! It’s so versatile. A close up or the Boden Adrianna shoes with the John Lewis & Partners gold bangle and the rococo pink Kate Spade Nicola bag. Lindsey and I hope you liked the outfits in this blogpost, if you can’t find the items online – then head in store at John Lewis & Partners Oxford. The John Lewis & Partners styling experiences, especially the Complete Style and Beauty day would be a great gift to consider for Mothering Sunday coming up shortly on 31st March 2019. The post PERFECT PAIR OF JEANS WITH JOHN LEWIS AND PARTNERS was on Loved by Lizzi first. Personal shopping sessions are free, however I was gifted THE COMPLETE STYLE AND BEAUTY EXPERIENCE WITH JOHN LEWIS & PARTNERS in January 2019.